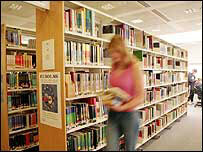 A reprieve for three libraries which had been earmarked for closure at the end of this month has been revealed. North East Lincolnshire Council announced earlier this month that four libraries in Grimsby were going to shut as part of a drive to save £5m. On Wednesday, the Grimsby Institute came to the rescue by taking over those in Nunsthorpe, Scartho and the Willows Estate. However, the Yarborough library has not been saved. The closures' were mooted in August when the authority announced cuts to public services, and the loss of 20 jobs. The authority needs save £5m this year and £10m in the 2004/05 financial year.